Metal Tee Pee/Tent for Miniature Gypsy Fairy Gardens. 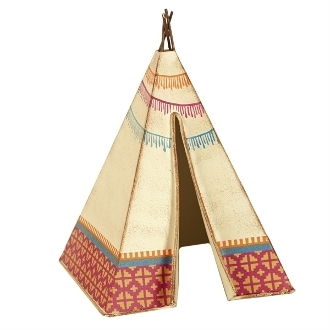 Full Description: You can create the cutest campsite around with this adorable mini tee pee! With beautiful patterns and hand-painted details, it's the perfect focal point for a southwest or camp-themed mini garden. Designed by Genevieve Gail. Features all-weather paint.